Note: Texas held its primary on March 4, with some races advancing to the state’s May 27 runoff. The first Tuesday of the month, May 6, features primaries in Indiana, North Carolina and Ohio. The Tar Heel State features the marquee contest, the Senate primary on the Republican side. There, the millions-of-dollars question is whether or not state House Speaker Thom Tillis (R) can win at least 40% of the primary vote to avoid an expensive runoff against one of the other seven Republican candidates in the field. Recent polls and our sources suggest Tillis may accomplish this task, which would allow him to save resources for the general election matchup against Sen. Kay Hagan (D). A week later, Nebraska and West Virginia will have their turns. Neither state has an incumbent running in a statewide contest, which is particularly notable in the very conservative Cornhusker State, where there are wide-open Republican primary contests for both U.S. Senate and governor. In the Senate race, the two leading GOP candidates, Midland University President Ben Sasse and ex-state Treasurer Shane Osborn, are ratcheting things up. Osborn recently attacked Sasse for previous comments regarding Obamacare, causing Sasse to respond with an ad starring his two daughters talking about how much Sasse “despises” the Affordable Care Act. In terms of endorsements from outside conservative groups, there’s no question Sasse has the upper hand: Citizens United just became the latest to back him, joining the Club for Growth, the Senate Conservatives Fund and FreedomWorks (which actually took back its endorsement of Osborn). Banker Sid Dinsdale and attorney Bart McLeay are also among those seeking the Nebraska seat. 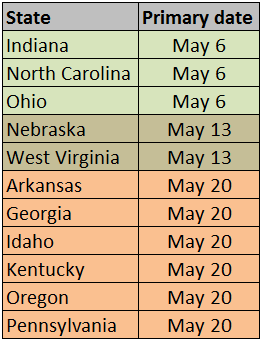 May 20 will see the final six primary contests of the month. In Georgia, Republicans will probably take the first step toward determining their Senate standard bearer. As no one in the field, which features five major candidates, is likely to win a majority that day, the top two vote-getters will advance to a July 22 runoff. Recent surveys show businessman David Perdue (R) ahead in the GOP contest, followed by Rep. Jack Kingston (R, GA-1) and ex-Secretary of State Karen Handel (R), and the eventual nominee will likely face non-profit executive Michelle Nunn (D) in the general election. The GOP’s two potential nightmare nominees, Reps. Paul Broun (R, GA-10) and Phil Gingrey (R, GA-11), are bringing up the rear in recent primary polling, and party leaders assuredly hope neither make the runoff. Elsewhere, Senate Minority Leader Mitch McConnell (R) is set to fend off a Tea Party challenge from businessman Matt Bevin (R) in the Bluegrass State’s Republican primary, setting up a probable November matchup against Kentucky Secretary of State Alison Lundergan Grimes (D). In Pennsylvania, vulnerable Gov. Tom Corbett (R) will learn the identity of his November opponent when Democrats decide their nominee. So far, businessman Tom Wolf (D) has been spending beaucoup dollars on ads with great effect: Polls show him with a huge lead in the race. It remains to be seen whether Rep. Allyson Schwartz (D, PA-13), state Treasurer Rob McCord (D) or ex-head of the state Department of Environmental Protection Katie McGinty (D) can close the gap with Wolf. The Corbett campaign believes it can overcome the early Democratic lead by stressing the Keystone State’s declining unemployment rate and relying on the state’s long tradition of changing parties in the statehouse every eight years (Corbett and the GOP have only been in office for four). 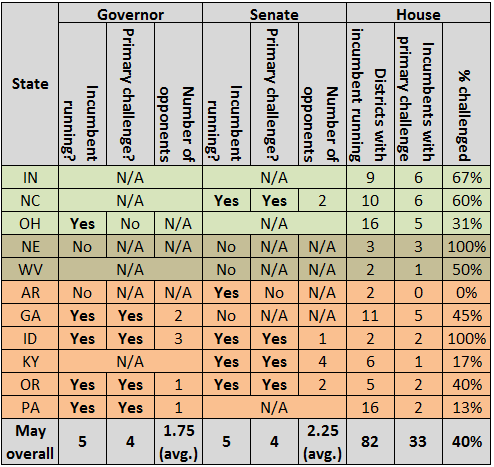 Several incumbent House Republicans face renomination challenges throughout May, although it’s hard to point to any individual race and confidently predict an upset. Highlights include Rep. Mike Simpson (R, ID-2) versus attorney Bryan Smith (R), which is a classic insider-versus-outsider contest pitting the GOP establishment against groups like the Club for Growth; former George W. Bush administration official Taylor Griffin’s (R) challenge to Rep. Walter Jones (R, NC-3), which is essentially an establishment challenge to an antiwar incumbent who is not beloved by GOP leadership; and Rep. Ralph Hall’s (R, TX-4) bid for an 18th term against John Ratcliffe (R), a former U.S. Attorney, which will be decided in Texas’ May 27 runoff. These or other primaries may generate surprises, but history argues against expecting any more than a handful of House incumbents to lose in primaries throughout the entire primary season: Since the end of World War II, just 2% of members who have sought renomination have been unsuccessful. In what was ultimately not surprising news given the longstanding ethical cloud over Rep. Michael Grimm (R, NY-11), the Staten Island representative was indicted earlier this week. The 20-count indictment accuses Grimm of hiding revenue and wages at a health-food restaurant he owned in order to avoid taxes. The problem for Republicans here is that it’s going to be hard for remove Grimm from the ballot. As the Staten Island Advance noted Monday, “The only ways Grimm can get off the ballot is if he moves out of state, is convicted of the charges against him, is nominated for a state Supreme Court judgeship, or dies.” A stunt to nominate Grimm for a judgeship would be both legally dubious and, given the circumstances, utterly laughable; Grimm also doesn’t sound like someone who wants to step aside, at least at this point. The beneficiary of Grimm’s apparent fall is former New York City Councilman Domenic M. Recchia Jr. (D), who presented a formidable challenge to Grimm even before the indictment. President Obama won NY-11 in 2012 52% to 47%, although John McCain won it by three points in 2008: Hurricane Sandy might have depressed the district’s turnout in a way that made it seem more Democratic in 2012 than it actually is. At this point, we have to assume that Republicans will be unsuccessful in their attempts to get Grimm off the ballot, and that an indicted congressman — even one with Grimm’s otherwise impressive political gifts — has to be an underdog in a politically competitive district. For all these reasons, we have moved NY-11 to Leans Democratic. Meanwhile, Republicans should easily capture the heavily Republican seats of retiring Reps. Jim Matheson (D, UT-4) and Mike McIntyre (D, NC-7). Additionally, we also slightly favor state Sen. Evan Jenkins (R) to defeat Rep. Nick Rahall (D, WV-3). Democrats say that Rahall is up off the mat now, and is even leading by a significant margin, but we continue to favor Jenkins in this 65% Romney district for reasons we outlined in depth last month. To recap, the House is currently 233-199 Republican, with one Safe Republican vacancy and two Safe Democratic vacancies. Our current Crystal Ball ratings show 231 Safe/Likely/Leaning Republican seats, 194 Safe/Likely/Leaning Democratic seats, and 10 Toss-ups. Split the Toss-ups down the middle, and Republicans net two seats. At this point, we suspect they’ll do a bit better than that: Our outlook for the House — a five to eight-seat GOP net gain — remains unchanged.